The US 2020 Census’ Participant Statistical Areas Program (PSAP)is under way. Every ten years, the Census reviews its existing boundaries. These boundaries serve as the foundation for tabulating statistics on socioeconomic data. The Census has designated WestCOG as the PSAP Primary Official (PPO) to oversee Census Boundary Updates for Fairfield County. WestCOG will be working with its member communities, neighboring COGs, and CTDOT to perform these updates. WestCOG has identified two tasks to work on during this process. Updating Census Designated Places (CDP), and reviewing existing census block-groups and tract boundaries. CDP Update: Census Designated Places (CDP) provide detailed socioeconomic information for a neighborhood, downtown district, or village that may be difficult to capture using census block groups or tracts. CDPs are currently used sparingly or not at all within CT. WestCOG has developed a methodology to update and delineate new Census Designated Places (CDP). The methodology can be downloaded here: CDP Strategy. A list of named places can be downloaded here: Fairfield County Named Places. WestCOG wishes to recieve these updates by May 15th 2019. BG and Tract Review: WestCOG will be working with CTDOT and municipalities to request edits to census boundaries. The goal is to develop boundaries most useful for analytics, regional studies,and traffic modeling. WestCOG is working on a methodology to standardize its role in this review/edit process. One process is to track down special use areas and anomaly areas as these locations throw off, or skew data within the census. More information on this process can be found on the Special Use Area Strategy. State mandate, PA-1875, requires communities to provide their respective COG with their latest Parcel and CAMA data by May 1st, 2019 and then annually thereafter. The request is timely, as WestCOG is looking into a Regional Parcel CAMA data viewer. For the communities of Newtown, Wilton, Brookfield, and Weston; the delivery of Parcel and CAMA data is being handled by New England GEO. A date for when it was last updated. A unique parcel ID attribute to link with the CAMA data. If you have a third-party vendor and you provide a contact, WestCOG would be happy to collect the updated data on your behalf from the vendor. CAMA Data Request: WestCOG is looking for a full CAMA data extract for all properties in your community. One approach may to collect the CAMA data extracts already prepared by many towns for Warren Group Reports. Once established WestCOG can access the data each year to meet the state requirement on behalf of the community. WestCOG is creating its Regional Plan of Conservation and Development and as such has been collecting and updating its data resources, one of which is zoning data. We have collected all our towns zoning maps in PDF format, but are looking for GIS datasets (or CAD if it’s the only option) so we can review zoning in the region and its correlation to demographics, economics, and natural resources. WestCOG seeks GIS or CAD data from each community. Datasets can be sent to Nick Trabka to <ntrabka@westcog.org> We hope to complete our inventory of zoning data by early May 10th. In 2012, WestCOG’s predecessor, SWRPA, received Regional Performance Incentive Program (RPIP) funds to develop a regional GIS program to develop a regional GIS Program which would host extensive data resources such as imagery, lidar, contours, and planimetric data. With consolidation of the State’s planning regions, the project was extended to the entire Western Connecticut Planning Region, and was expanded to cover additional tasks (in the areas of property assessment and records). This data collected was known as the 2014 Kucera Flight Data. Flight Data for Northern Towns: RPIP funds were utilized to develop planimetrics data for the 10 northern towns in the WestCOG Planning Region. This effort was performed in 2016 using data from a state flyover performed in 2016. Planimetrics Update for Developing Areas: In areas with high development activity (Stamford, Norwalk, and along Route 1), remaining grant funds were used to update planimetrics data to match 2016 state flight data. This work was completed by Sanborn in 2018. Axiomatic, in partnership with WestCOG and its members, conducted a study of opportunities for regional cooperation in property assessment and records, including the viability of a regionalized Real Property Computer Assisted Mass Appraisal (CAMA) system. This report is explained in detail in the Existing Conditions & Initial Recommendations Report. Regional GIS Parcel-CAMA Study: This service would develop a sustainable approach to collect and standardize parcel and CAMA data across the Region, and to share these data via the web. The report provides a breakdown of cost benefits, best practices, and an implementation strategy. Following this report, WestCOG has performed a Request for Information (RFI). Following the RFI, WestCOG Foundation Inc. is now in the middle of a Request for Proposals (RFP) to identify vendors to provide this service. This project is expected to commence in 2019. This project is explained in detail in the Regional GIS Web Application Recommendations Report. These projects are explained in detail within the Regional Recommendation Prioritization Report. A collection of past GIS project are stored here. This federally-funded project involved utilizing Census data to determine the relationship between under-served populations and the accessibility of transportation. This overview provides an introduction to the project. This report evaluates passenger vehicle data from the CT DMV to determine the progress of Electric Vehicle (EV) adoption in the WestCOG and spatial relationship between EVs and charging station. Using data from the Municipal Fiscal Indicators gathered by the Connecticut Office of Policy and Management, this report provides an analysis of property appraisal accuracy in Connecticut by comparing the sales price of properties sold between 2011 and 2014 with their appraised value (report, annex). Using data from the Municipal Fiscal Indicators gathered by the Connecticut Office of Policy and Management, this report tracks local government revenues and tax rates through the years. Using data from the Municipal Fiscal Indicators collected by the Connecticut Office of Policy and Management (see report titled “Trends in Connecticut Municipal Finance” above), this report investigates unexpected changes in municipal revenues from state transfers. Click here or on the map below to access WestCOG’s Regional Map. The map displays much of WestCOG’s regional data which includes, building foot prints, pavement footprints, contour lines, road features, and even street trees. The GIS and Analytics Group at WestCOG provides technical and consulting services for the 18 municipalities in the Region along with Mapping and Data information related to transportation, land-use planning, the environment, and demographics. Our data services page is here. Our data can be downloaded here. GIS projects can be found here. Town maps can be accessed here. Contact Michael Towle at mtowle@westcog.org for more information. The GIS and Analytics Group at WestCOG is technically skilled with diverse expertise in a variety of domain areas and data types (e.g. environmental, transportation, and land-use). In addition to GIS skills and software, we have expertise in data processing, geoprocessing, scripting, image processing, and other analytic areas. Contact Michael Towle at mtowle@westcog.org for more information. The GIS and Analytics Group at WestCOG can help you conduct your data analyses and mapping visualization using a wide variety of analytic tool, methodologies, and approaches. Our staff has backgrounds in fields like GIS, remote sensing, economics, landscape architecture, geology, natural resources, and environmental science, land-use, and transportation. Call us with your questions. You might have something specific you want to be able to perform in house. Contact WestCOG to setting up a training. Learn to use Arc Collector (Free with you Arc Subscription) to collect data in the field with your phone. How to get your excel data into GIS, join it with shapefiles, and how to bring it back to excel. WestCOG has acquired a robust collection of regional data layers usable for map making, analyses, and planning. Much of it is derived from Planimetrics Data acquired in 2013 (SWRPA) and 2015 (HVCEO). Downloads are available below and by request. The FTP source page where the files below are stored. Here is a complete listing of publicly available data. Town, regional, congressional, and school district boundaries. Census designated regions include block, block group, and tract shapes for our region. 20, 10, 5, 2, and 1 ft contours for the WestCOG region. Deata derived from 2014 Lidar Data. Parcel data for communities in the WestCOG region. Culverts and impervious cover totals by town, watershed, catchment areas and parcels. Pavement polygons, road center lines, and street features. The most recent imagery for the region is 3″ and 4-band imagery from the 2016 statewide flight and can be obtained on CT Eco. Imagery of the same type is available from the GIS Department for 2013 (SWRPA towns) and 2015 (HVCEO towns). If needed, please contact WestCOG directly to establish a form of data delivery. Digital Elevation Model (DEM), shows elevation of the surface only and does not represent features such as trees or buildings. Surface Elevation Model (SEM) depicts features as well, including buildings and trees. A large data set not available for download. If needed, please contact WestCOG directly to establish a form of data delivery. 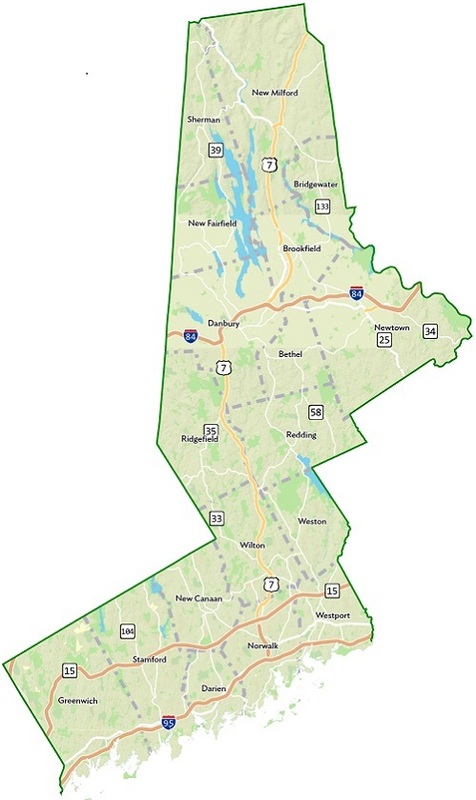 Connecticut Environmental Conditions Online (CT ECO) shares imagery and environmental information with the general public through map services. The primary data source of environmental and natural resource data from the State of Connecticut Department of Energy and Environmental Protection. Home to some unique data sets. A source of geographic information and Census data and is affiliated with the University of Connecticut library system. The data clearinghouse for the State of Connecticut. A source for municipal and state demographics and government oriented data sets (e.g. public safety). Striving for informed decision-making across Connecticut. CT Data Collaborative empowers an ecosystem of data users by democratizing access to public data and building data literacy.